Gather the kids and neighbors around the computer and watch this week’s fun-filled episode of Monday Madness. This week, Tim and Scott give some advice on how you can be a better Lent Madness evangelist in your local church. 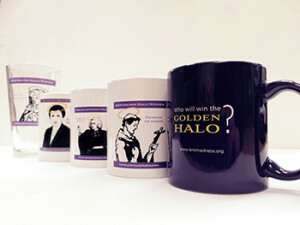 They also remind you to post photos of yourself with your Lent Madness mug or pint glass with double hashtag #LentMadness #MugShot to have a chance to win the actual St. Francis cutout figure used for many a celebrity photo at last summer’s General Convention of the Episcopal Church. Remember, you can always binge-watch past episodes over at Lent Madness TV on Youtube. Or if you’re feeling inspired, you can go get a Lent Madness t-shirt to watch while you’re holding your viewing party. 13 Comments to "Monday Madness — February 22, 2016"
I kinda miss Cramner and Chrysostom. The imaginations of our SEC Padres is beyond human belief…..well, not exactly since nobody would play the game otherwise…..you get my drift. I am curious each day to tune in and read what new ditty they’ve thought up for the evening and to entice readers to play the game the next morning. Geez…..they’re challenging their own hand-picked bloggers. Keep it up ! Love it ! Well Said!!! This is my first year, I feel the same as you every morning! Be adapted for public education. Kateri. He sent me an email telling me how he looked her up and learned so much! THANK YOU TO THE SEC!! YOU ROCK!! I just watched the Padres’ little movie. When it ended after all the suggestions which, if used, are going to get a lot of folks’ names stricken from the church rolls, unless they’re heavy pledgers and some priests defrocked…yes, this is a run-on sentence. At the end of the 7 minute message, I was overjoyed to see a JACOB TOO-TOO sequence. It made me so happy and I’ll be eagerly awaiting the news of Kateri (sp) as the winner in the morning. What do we do to win St. Francis if we are not on social media? May we sent our photo to you another way? I just heard the bit about knitting the saints on a purple stole. I’m a knitter, and: ARE YU KIDDING? Those stitches would have to be super, super tiny. A stole like that will be ready next year! It was MUCH easier to utter “Lent Madness” upon receiving a shekel for naming Mthodius and Cyril two Sunday ago. I will, however, continue wearing my purple cardigan. Tonight my PBS station is airing a repeat episode of “Sacred Places of Britain.” Thus far it’s been about Iona and St. Columba. Coincidence?? I think not. What if you are old and a luddite and don’t know what in the heck ‘hashtag” means? Where do you use it? Is this just a Twitter (and that word means something else entirely to someone of a certain age) thing? If so, how in the heck does someone use twitter? I would like to make a suggestion. I think there needs to be more Lent Madness merchandise. I’d really like to see a mug with “ECW chicks dig Lent Madness!” Just a thought. I see your usual salutation is Happy Lent. While Lent may be happy, especially for those of us enjoying Lent Madness, the suggestion I have heard is that Holy Lent or Blessed Lent is most appropriate for this season, as it does encourage prayer, fasting, and giving. Why can’t one be “happy” when praying, fasting, or giving? Didn’t Christ tell us not to be like the hypocrites who go about in a gloomy state when doing those things? I’m not opposed to calling Lent “blessed” or “holy” but I don’t think “happy” is a contradiction. It’s a season on return to baptismal grace. Nothing quite so happy as that. 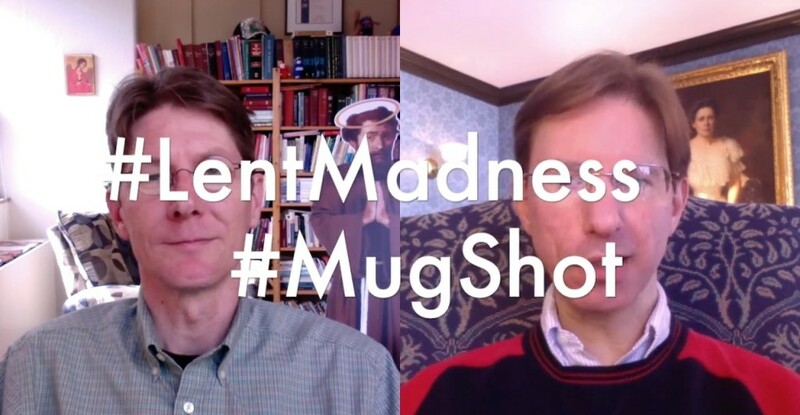 My Sunday School class at Holy Cross Church in North Plainfield, NJ, is doing Lent Madness this year and we are planning to enter the “Mug Shot” contest — already took our picture and they are very excited about this. I have Facebook and I have a twitter account, but I also have not # tagged anyone or any group before. Any basic info on what you click on in Facebook or Twitter to send the photo? I’ve tried all the little icons and not sure which one will do it.